It's been awhile now since I finished using the SK-II Stempower and the SK-II Signature Eye Cream. This review is way long overdue. But well, I wasn't too excited with writing this post mainly because a) I was pretty caught up with work before, and b) I felt that the moisturizer was pretty good but I wasn't too impressed with the eye cream. As you probably already know if you have been reading my reviews, SK-II Facial Treatment Essence is my holy grail pre-essence which really sparked my curiosity for the other products in the SK-II range. Hence, the moment I finished up my Clinique All About Eyes (another eye cream that I failed to review here due to being too underwhelmed by it), I decided to burn my pockets and purchased the SK-II Signature Eye Cream along with the SK-II Stempower at the airport while I was travelling on a business trip. Both products come in the SK-II signature red glass jar with a screw cap cover (I threw the eye cream jar away while I was travelling in Aus earlier this year). Whilst the packaging is really luxurious, I didn't enjoy them as much since they are pretty hard to travel with. The brand is pretty thoughtful to add in a small plastic spatula with each of the product and this I supposed was for you to get the product out to prevent contamination. However, being a 15 mins get ready type of girl, the spatula was really not for me and I just preferred using my fingers instead to get the product out for application. 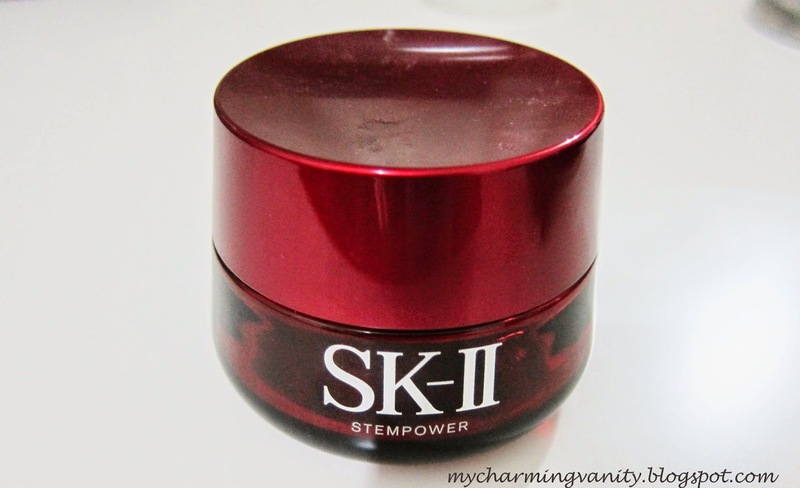 To start off, I'd talk about the product that I favored more - SK-II Stempower. As I'm in my late twenties now, I'm always on the lookout for the next best anti-aging moisturizer. The moisturizer claims to be able to improve overall skin firmness and the appearance of pores. The product comes in a white cream format (scentless) and absorbs pretty easily into my skin after application. After using this product for months, I didn't notice considerable improvement in the firmness of my skin but I thought that the product did help maintain my overall skin firmness. However, I did notice that my pores were less visible, which is something that I was quite happy with. However, fast forward to the last few weeks of using this product, I started to slack off my night routine due to hectic work schedule. I noticed immediately that my skin started to have dry patches here and there when I skipped using the moisturizer at night. That was really something else that never occurred to my skin before even when I used to skip products, which got me to deduce that that the only possibility was due to the moisturizer (weird right?). Whilst I do like the product, I didn't rush out to repurchase it as I didn't like the idea of my skin getting used to this high price tag moisturizer and I feel that this is probably something that I should revisit again in a couple more years. Similar to the moisturizer, SK-II Signature Eye Cream comes in a creamy thick texture which upon application, absorbs fast into my delicate undereye area. It also does a good job in keeping my undereye moisturized and keeping new lines away. Whilst I do like the overall texture and moisturizing effect, the product really underwhelmed me as I didn't find any differentiating benefit of it as compared to other more affordable eye creams (i.e. the predecessor Clinique All About Eyes which was half the price had the same effect). Perhaps it was due to the Facial Treatment Essence setting a really high bar to the rest of the SK-II range, I had higher expectation for this eye cream especially due to it's high price tag . Overall, I'd say that among these two products, I'd recommend the SK-II Stempower and would probably repurchase after I have try out the other options out there. That said, if you are looking in to splurge on this product, I'd think that this will be more ideal for mature skin types. As for the eye cream, it definitely is not something that I'd recommend unless you are open to spending more on the high end and luxurious side of the alley.